Several people have asked me about our “origin story,” as if we were superheroes or supervillains, haha, whichever the case may be. The truth is we’re a group of midlife women who came together BECAUSE of our love of fashion and fun. I did not know Robin and Kathy until Tammy introduced them to me, and they did not know Suki until I introduced her to them. At the center was Tammy and I who knew each other in college and were in the same sorority house. We looked around among our friends for women who had something to say about over-fifty fashion and this fantastic time in life. 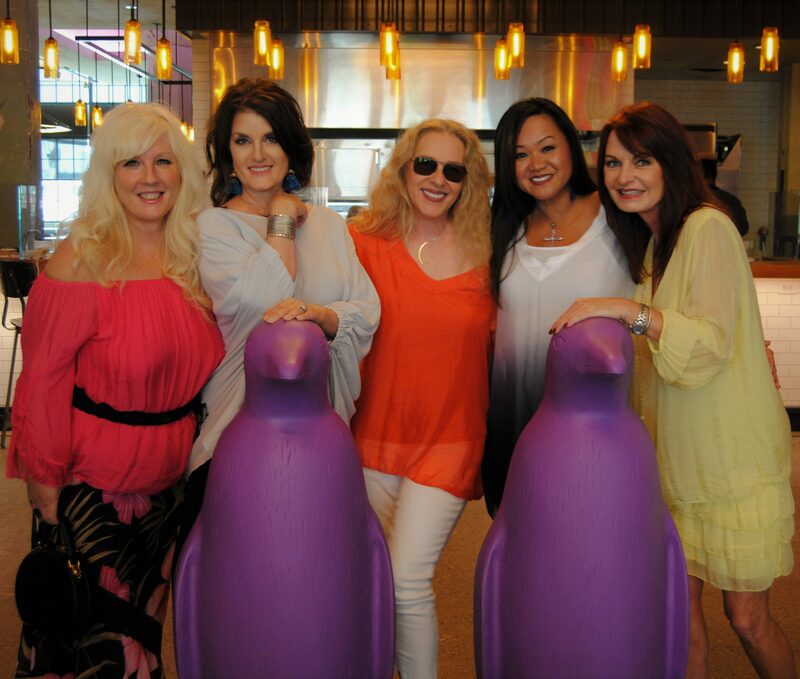 From left, Tammy, Robin, Kathy, Marcie, Suki, and Andi. Darrin is here too! — behind the camera. I knew Tammy as a lifelong lover of fashion, a woman who celebrates all things girly and romantic, a woman who lifts up other women spiritually. I’ve never known her to say anything unkind about another woman. She is unashamed of what makes her womanly and uses emotion as her strength. She is our heart, our touchstone for the rest of us. Obviously she’s a great listener. Tammy is a wedding coordinator who used to own a premier tearoom, and her youth was spent in fashion retailing. She is bold and fluid creativity. She is everyone’s biggest personal cheerleader. Tammy and Marcie who met in college in 1982. Kathy is one of the funniest women you’ll ever meet, who keeps us in stitches. She’s a careful planner, with a strong vision of what works for her, which is straight-up, old-school, classic glamour. I can’t wait to see her lipstick selected for an outfit or what vintage jewelry piece she’s sporting. An avid antiquer, she is drawn to the past, when women were spunky with the droll comments and the one saucy arched eyebrow. She’s basically Claudette Colbert in “It Happened One Night,” sitting on her vintage suitcase by the side of the road, making wise cracks about Clark Gable. In pictures of us all laughing, Kathy has just said something coy and hilarious. Robin is smart and savvy, polished and professional. She exudes warmth, with a deep, lush voice and laugh. Robin’s career is banking but she has been involved in the fashion industry in various ways just as long. A previous partner in a showroom for emerging designers at market, she represented several clothing and jewelry artists and their lines, working hard to help new talent break through. Her expertise is invaluable to us, and she is gifted with the “eye,” to help the rest of us put together outfits, arrange a pose and setting, and “tell” the fashion story in our heads. With her on the scene, our details are spot-on. Robin and Tammy are related somehow as distant cousins — somebody’s aunt is married to somebody else’s uncle or something! I met Suki when our sons were in the same Boy Scout troop many years ago. We were both bonafide, really-camping Scout Moms! And we instantly connected through our shared amusement of everything happening around us. Our Suki goes hard! She has like 10 outfits shot and in the can, ready to run at any time, while the rest of us are wondering what to wear and talk about next. Lol. Meanwhile she is charging ahead to the next season, or hill, with her eyes fixed on the horizon. She is a determined force to be reckoned with! Why did I even start this blog? My bachelor’s degree is Journalism, but I’ve written in all styles, for all purposes, over the years. When I did a little life inventory upon turning 50, I remembered how much I loved and missed writing about fashion and art as a newspaper reporter in my 20s. What a happy, exciting thing that was for me. I would rustle up people, clothes, and places to take pictures for Sunday edition feature stories. Blogging is the 21st-century version of that! An old clip of a maternity fashion feature I did in 1989. Yes, I hunted down pregnant ladies, took them to the park, then asked them to kick their shoes in the air. I don’t understand that either now, lol. Me … these people give me confidence. We all belong to other girl-gangs from high school, work, or church, but this one? We just click. We laugh so hard the entire time we’re together. We love our differences, we complement each other perfectly, we bring out the best in each of us. We can’t wait to get together and hang out and play in clothes and shoot pictures. THIS IS FUN. When one of us walks in the room, the rest of us look at her and smile. And Darrin? He captures all this unspoken dynamic between us in photos and creates his own perfect dynamic with us with his gentle, understanding, imaginative vibe. Ahhh, Darrin…and Andi! — his very cool 16-year-old daughter/ sidekick. How did they become such a big part of “us” too? Darrin and I both were paid student photographers at our college, and we re-connected a few years ago at a photography exhibit opening for another of our past college photographer cohorts. Since we come from the exact same place and era as working photographers, Darrin knows my thoughts for composition, light and angle before I even speak them. In his job, he’s responsible for the critical technology for a lot of people in different government agencies, but photography has remained his creative outlet, and the iphone his new tool of choice. His mind is always seeing what others are not, elevating the mundane world to an artistic moment, and he has a large following for his art photos on Instagram. Someone asked me recently why he would want to help photograph a bunch of crazy women and their clothes? Why wouldn’t he? Maybe because we can’t stop laughing when we’re all together? We enjoy being creative and supportive together. We all make each other feel beautiful and relevant and appreciated. We feed the soul in so many ways. Marcie gets a photograph of the photographer and his mini-me assistant. I may have started this blog but there wouldn’t be a blog without them. I’m the so-called experienced writer, photographer, blogger — all the nuts and bolts, the machinery of the thing, but they are the heart, the fun, the creativity, the courage, and the drive. They are the beautiful spirits captured in images, the clever thoughts captured in words. Previous PostTammy: The Secret Garden Kimono Next PostKathy: Mamma Mia! Five beauties for sure runway in bathing suits. WOW!!! Marcie you wrote some beautiful words about each lady. Such great pics. Tammy just is having so much FUN!! !